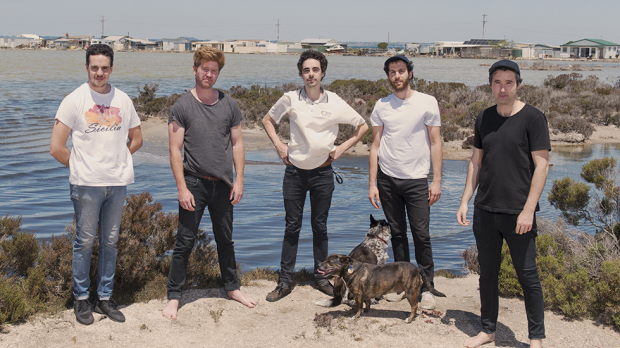 Melbourne indie rockers Rolling Blackouts Coastal Fever are a band on the move. Already embraced worldwide thanks to their first two EPs and schedule of constant touring, things are only set to get bigger for the band with the release of their debut LP, Hope Downs. MICHEAL HOLLICK interrupted Fran Keaney (one of the band’s three singer-guitarists) who was enjoying a late lunch of a Mexican wrap, to get the low down on the group’s new album, their future plans and just why on earth anyone would name a record after an iron ore mine. We last saw Rolling Blackouts here in Perth as part of Laneway. What have you guys been up to since then? We were just on tour, going around the United States and the UK. It was pretty warm, and you know when you’re touring and it’s hot, it’s never a ‘good’ hot as you don’t get to go to the beach or anything fun. You just keep on lugging your gear around. But did you have a good time touring the US and the UK? Yep, it was a dream, a great experience. While it was pretty hectic (we did 50 gigs in 60 days) it’s only now we’re back home that we have begun to realise what we just did. Like, “Wow, I actually went to all these places,” you know? We were in Hamburg, but also in Wyoming, and then New York; all these different places in such a short time frame is a lot to take in. What were the highlights from the most recent tour for you? For me, the London show really stood out. We played at the Electric Ballroom in Camden, and all 1200 tickets sold out. I don’t think [our success overseas] has sunk in yet for us. It was only last year that we had our first overseas tour, so it’s still such a trip to play and see people singing our songs on the other side of the world. We did also have a few sold out shows in New York and around the UK, but the Camden gig stands out. It was just bananas. Do you, or any of the band, have an idea of how people are reacting to your music outside of Australia before going on tour? You can get a bit of a sense on social media, like when people message you and say “Come to the UK” or whatever and when you book a tour you do get an update from the sales of the tickets. But nothing actually prepares you for seeing that size of a crowd and that they’re actually there for our band. And then after, when people come up and say things like “I stumbled across you guys and now you’re my favourite band,” it’s just really cool and it’s all very new for us still so none of the surprise has worn off. How would you describe the music that Rolling Blackouts make? I guess I would say that we used to write punky country-pop sort of tunes, and then as time has gone on we have developed a better sense of who and what we sound like. It’s just become more of an ‘us’ sound. There’s always that discussion when we’re writing a song that it’s good, but it doesn’t sound like us. And the ones that make the cut are always the ones that just immediately sound like a song we might write. The last song on our album, The Hammer, we wrote that after we had recorded the rest of the songs. We were jamming on something while on tour in the UK last year and the riff just came out. Joe put the melody on it and it was just like “That’s another one of our tunes” (laughs). That was one of the songs that straight away fell out and it just sounded like us. What kind of music has inspired the band’s sound? The Triffids, The Church, The Go-Betweens, The Ups & Downs, and also the Flying Nun [record label] bands; those are all bands that we have listened to for yonks. But I don’t think we’ve consciously gone out to sound like them. The overall soundscape is probably more of a natural sort of thing. It’s a very basic setup; bass, drums, two electric guitars and an acoustic. We developed a sound that just comes naturally to this particular group of people being in the one room together. Your band is quite unique, having three vocalists. How does the lyrical process work in the band? Who gets the final say? The lyrics come last in terms of writing the songs generally; they are the final piece of the song to be set. Usually we will have an idea, we bring it to the band, we will have one or two lyrics that just fall out and when we’re playing, we just ruminate on those ideas that tumble out immediately. Then it’s a case of standing back and trying to work out what the song is trying to say and then it’s, well at least for me, that slow process of piecing that together. The other guys are a little bit quicker. Tom, for example, will sit on something for a little while and then he will come to practice and say “I knocked out the lyrics to this song last night” and it comes out fully formed, and you can tell that these ideas have been welling up and then he has this outpouring of his lyrics. Joe has a similar approach to it. Me, well, I might have the first verse but not the second and the process can take months. And with lyrics, songs have that transportative element, and if there are good lyrics, then they can just take you further. Would you say that you are trying to tell stories and stir up emotions with your lyrics, or do you think they are more a form of social commentary? I think the mood of the lyrics are not quite nihilist, but they’re kind of “We’re here for now, and that’s cool”. The lyrics that I did, An Air-Conditioned Man for example, is about a guy who thinks he is stuck but then realises what it is that is eating him up and what he needs to do about it. Sister’s Jeans is a song for a friend who is having a crap time and needs to know they have a friend there. Time In Common is a song about my girlfriend, like two flashes in the pan that just happen to be, and how cool that is. What is the story behind the song How Long? I did the verse for that one. I heard this story about a guy who was building a big hole in his yard just so that he could upset the land around him, and then no one would be able to develop around his property. When I heard that, it sounded just like a fable to me. To this day, I don’t know if his own house has fallen in, but in my mind, that would be the end of the fable. And finally, how did you settle on the name Hope Downs for the album? I came across the title about two years ago when I was reading about [Gina] Rinehart, back when it looked like she was about to become the majority shareholder for Fairfax and she was in the news quite a lot. I thought, “What a wonderful name; prosperity based on an empty hole, it’s so fitting”. And as an album title, it’s not that we’re being overtly critical about mining or the prosperity it purports to bring, it’s more about if you think about being there and standing on the edge, just looking down into this huge human-made grand canyon. It really tied a lot of the song’s themes together; the big uncertainties that are in life and how the little person comes to deal with those.